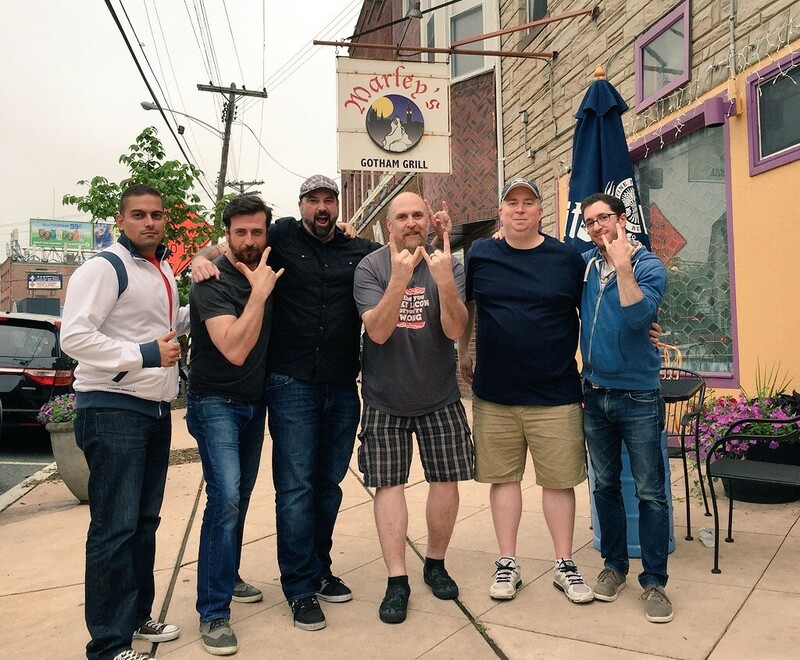 Wing-Off member and Big Brother Season 13 cast member, Adam Poch was invited to join the NJ Munchmobile on a statewide search for the best Wings. Honestly, we were a little upset that he didn’t find a way to work us into the NJ Munchmobile event. Once completed, he came back to the NYC Wing-Off crew with his findings. 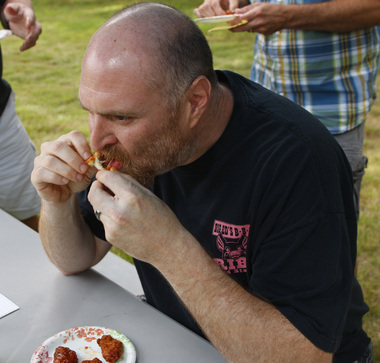 Adam wanted to only take us to the best of the best so he organized the very first ever NJ Wing-Off. Their menu has all the meat goodies you expect from a barbecue restaurant like pulled pork, brisket, ribs, bbq’d chicken and more. 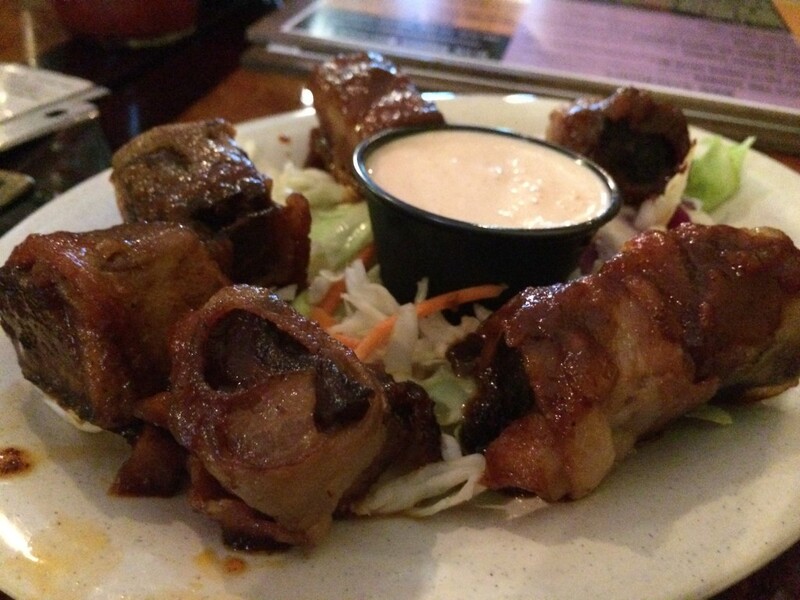 But Hot Rod’s takes it a step further by offering them as is or in new-school style dishes like a brisket cheesesteak, maple bourbon bbq chicken sandwich and pulled pork mini egg rolls. Yeah, you don’t see that and not order it!!! From there, it was on to the wings. 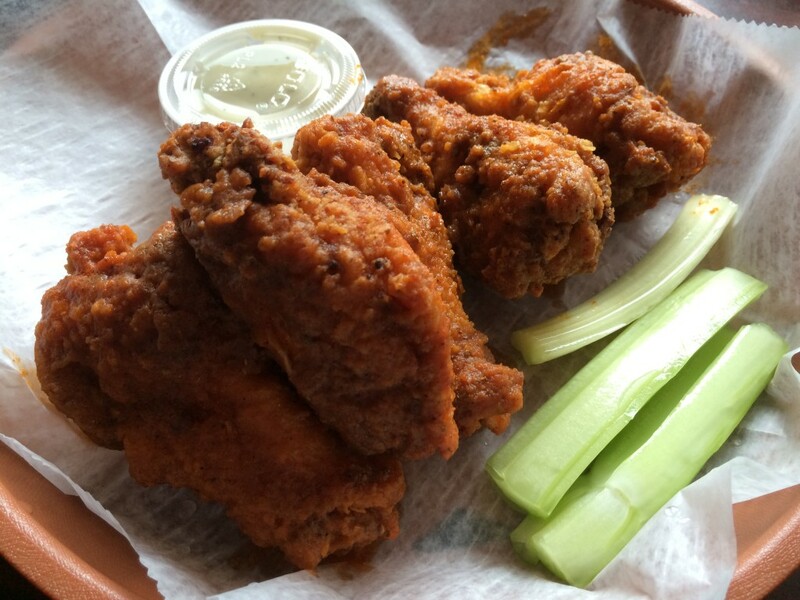 Hot Rod’s takes their wings and first coats them in proprietary seasoning. From there, the Wings are then smoked in their pit for about 3 hours. 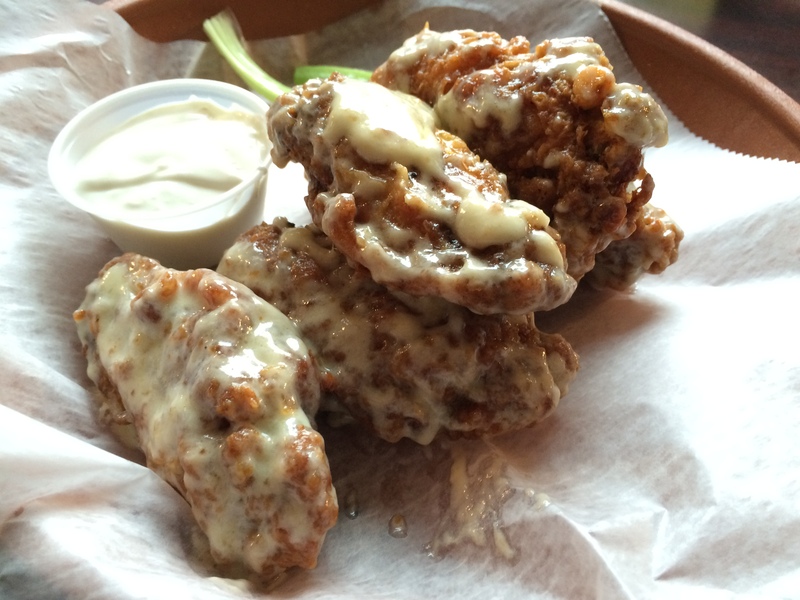 Once adequately smoked, the wings are then flash fried and then coated with your choice of sauce. 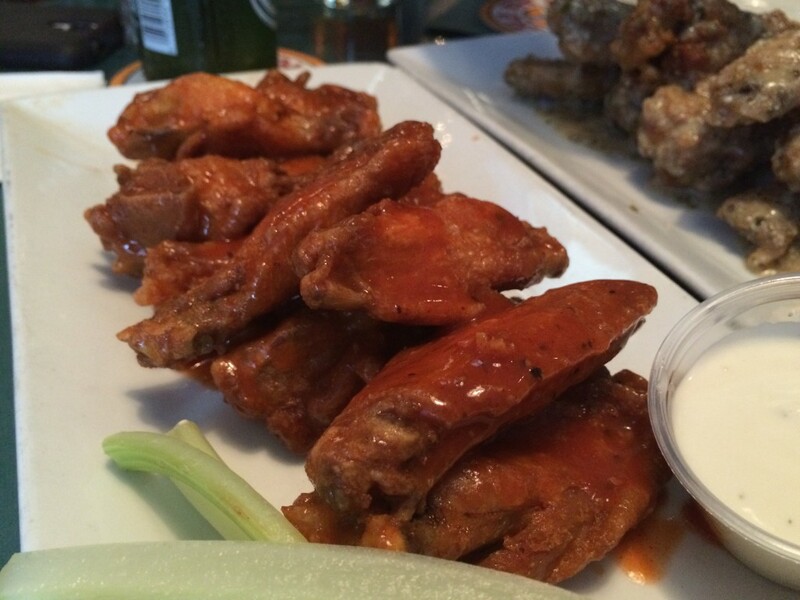 … unless you are the NYC Wing-Off crew!! Adam, being the man of flavor that he is, asked if they could make us a basket of wings using the the maple bourbon bbq sauce. He’s a good person to take eating with you. 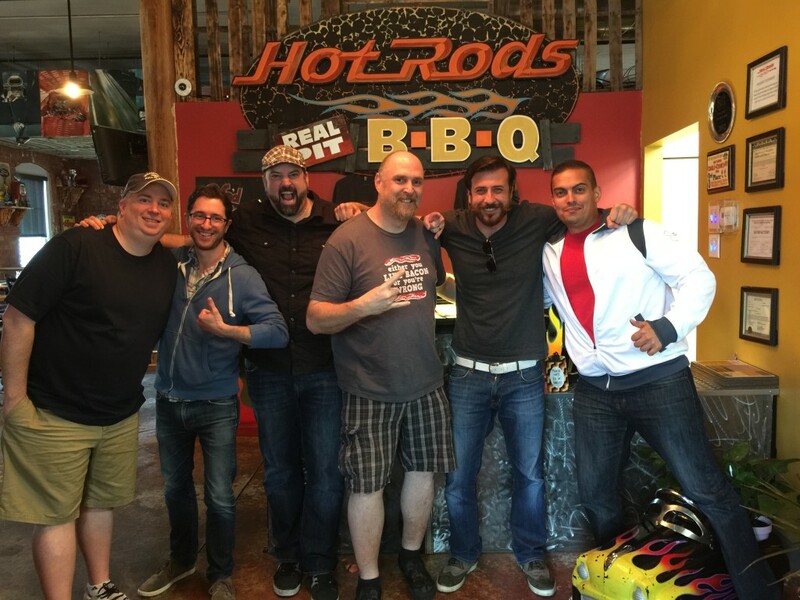 Hot Rod’s obliged! We gobbled our way through each of them, barely taking a moment to breath. 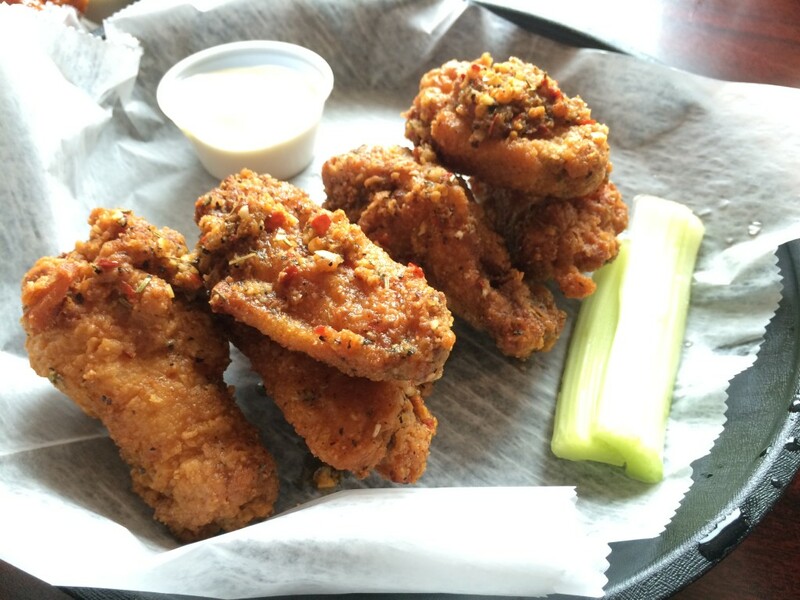 These are not your average wings. The smokiness from the pit really comes out in the overall flavor as does the seasoning rub. 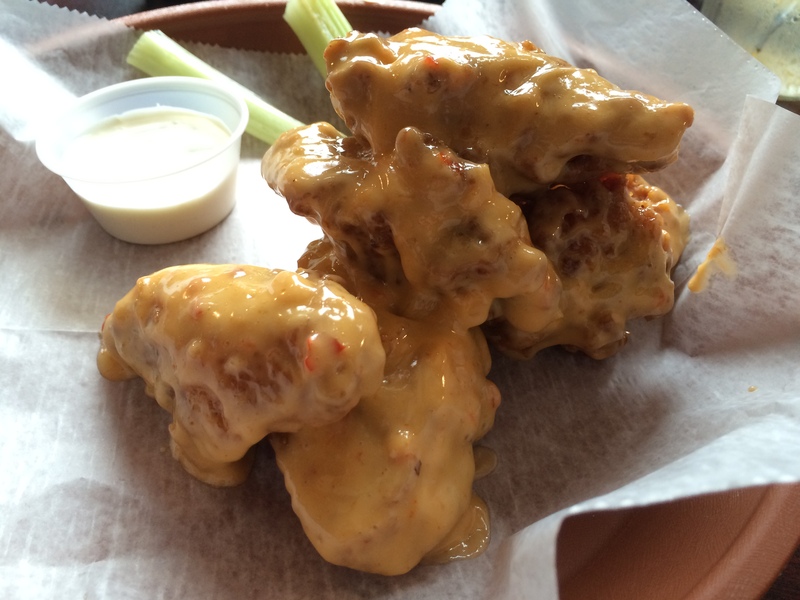 Most wings, all you taste is the chicken and the sauce but these two elements bring something to the wing that makes them very different and unique. 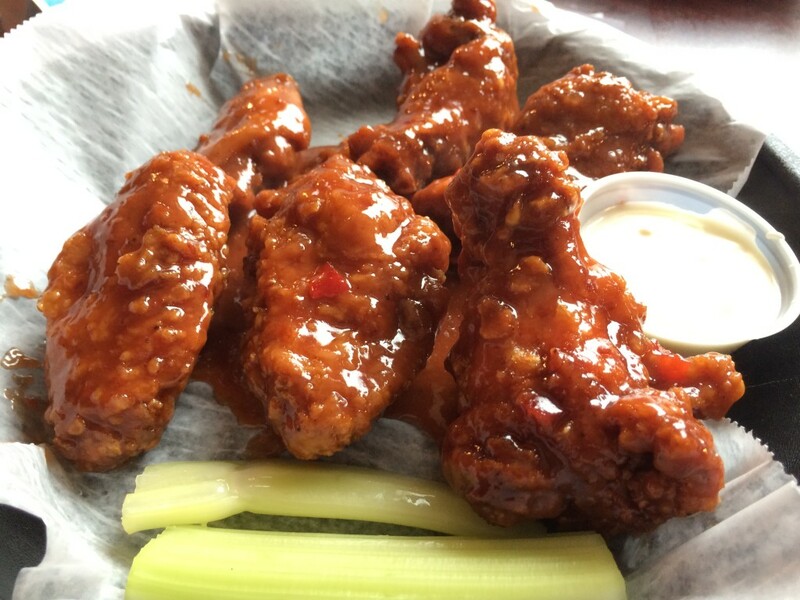 We crushed through 24 wings and if you head to Hot Rod’s BBQ, we suggest you do the same — try them all. Let’s set the tone right on this one. 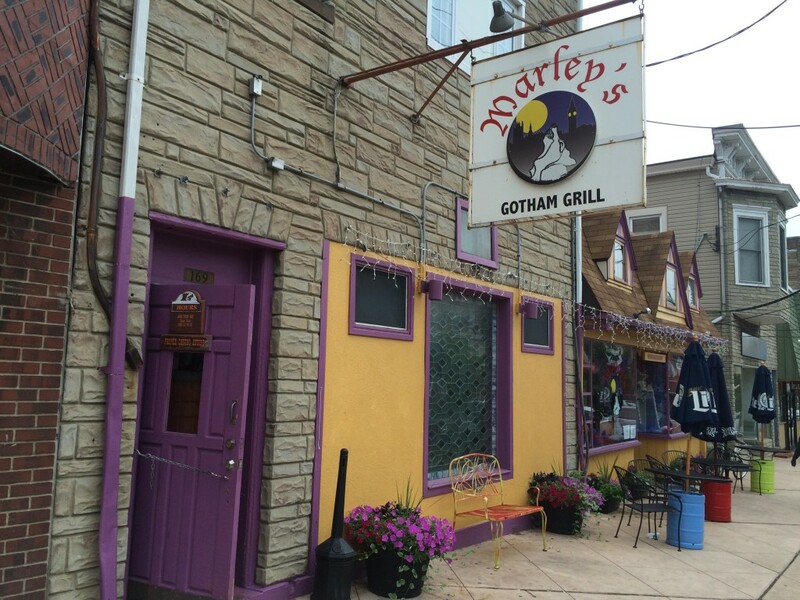 Marley’s Gotham Grill is located in Hackettstown, NJ. It’s 53 miles West of Manhattan. 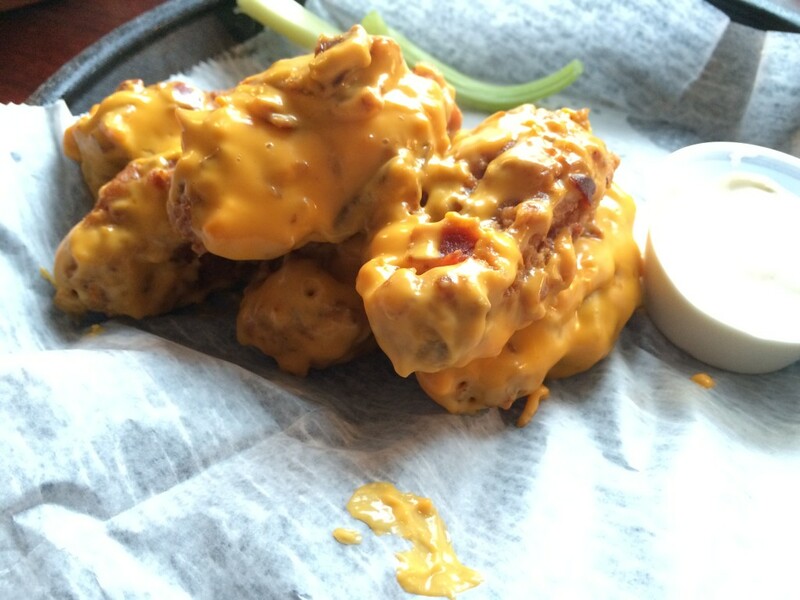 You’re not going to drive all the way out here for just any old chicken wing. To me, Hackettstown is the middle of nowhere and when you arrive there, you’ll think the same. But take a look at the photo above. 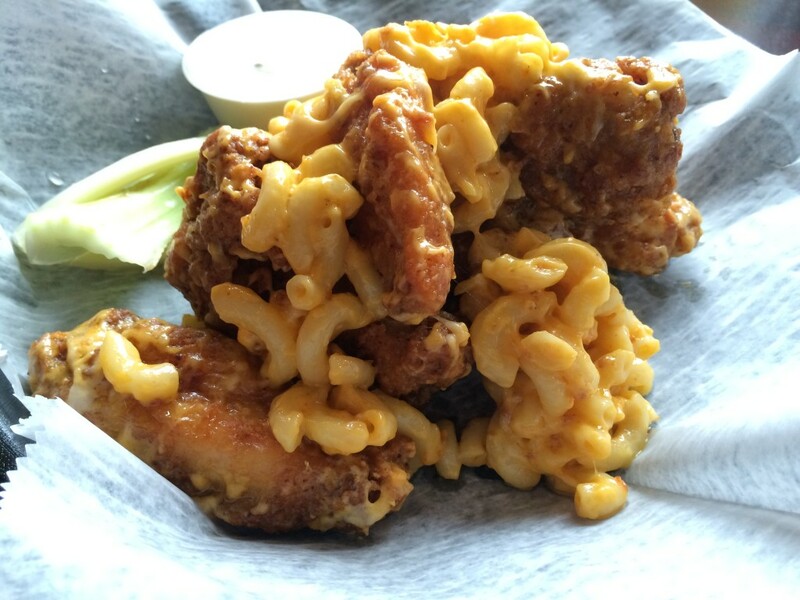 That’s a basket of Marley’s Mac & Cheese Wings. That’s level of game we are talking about here. And that’s only the beginning. 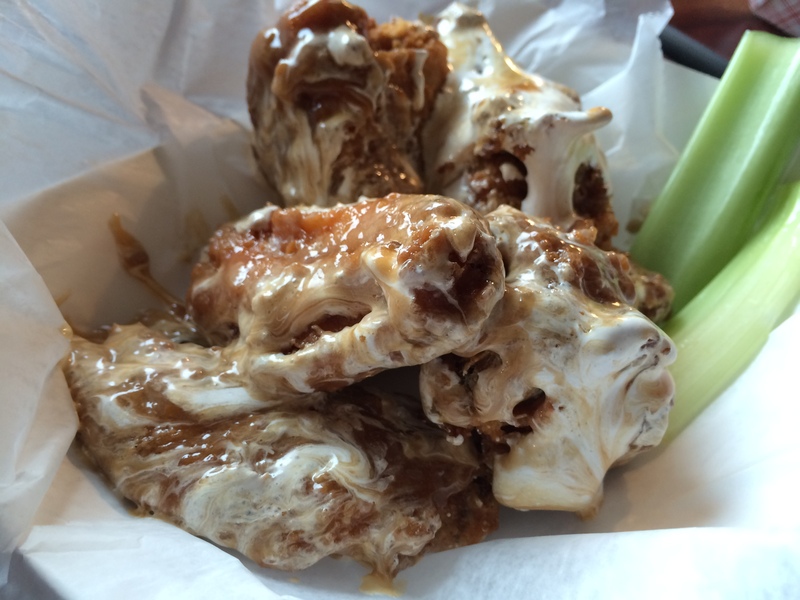 Marley’s offers 101 different Wing flavors and the menu is constantly changing. To a crew like us, this is like staring into the eyes of oblivion. 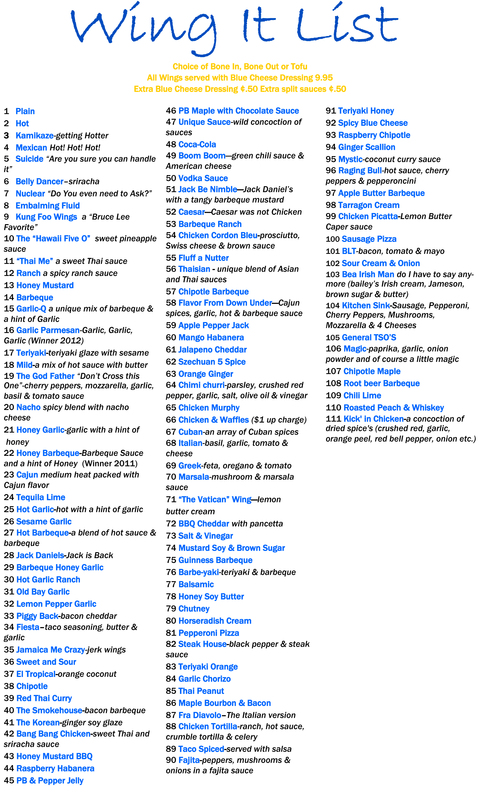 It’s a never ending list of delights and as soon as you see one you want, you see another one that splits your skull. Focus. We had to focus. 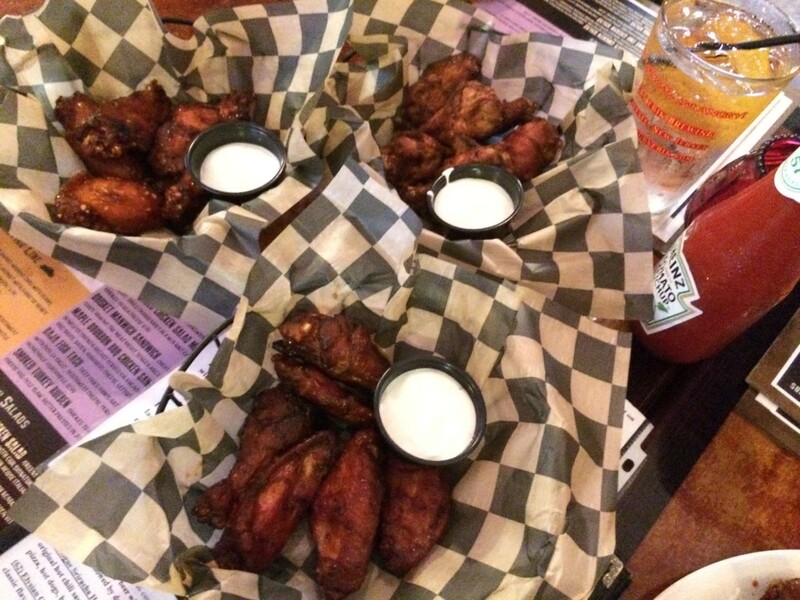 Each person on the Wing-Off was asked to chose one Wing, no vetos allowed. Only Marley’s owner, Bruno Pascale, was allowed to veto our order to ensure that we chose the best of the best. Marley’s goes through 35,000 wings per month so we felt pretty secure in letting Bruno help us choose. Rollercoaster – a mix of 7 different sauces. 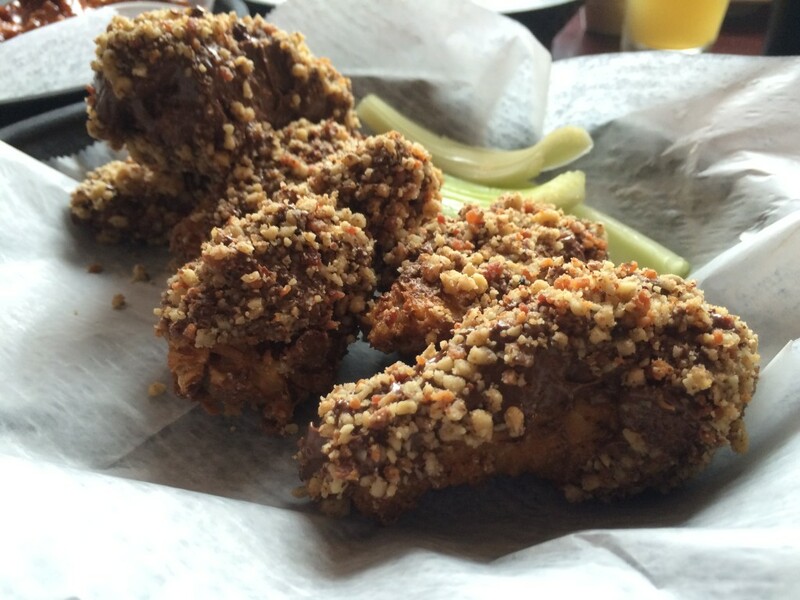 Chicken Gone Wild – tossed in Nutella chocolate rolled in bacon and candied walnuts. OK, so maybe we ordered more than 1 per person. And maybe, after all that, we ordered more because, heck, when were we going to be in Hackettstown again? Can’t remember which wings these were. The brain was mush by this point. 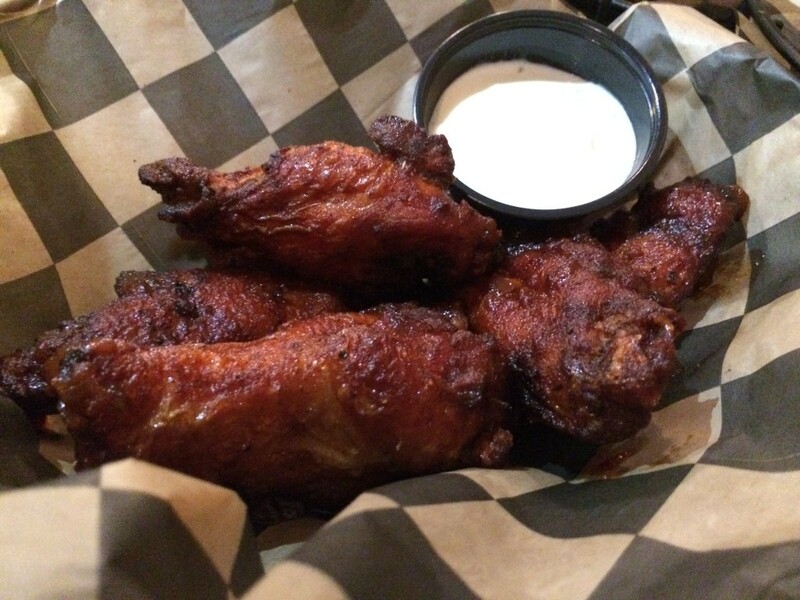 Marley’s Gotham Grill is not wing paradise. It’s not even wing vahalla. 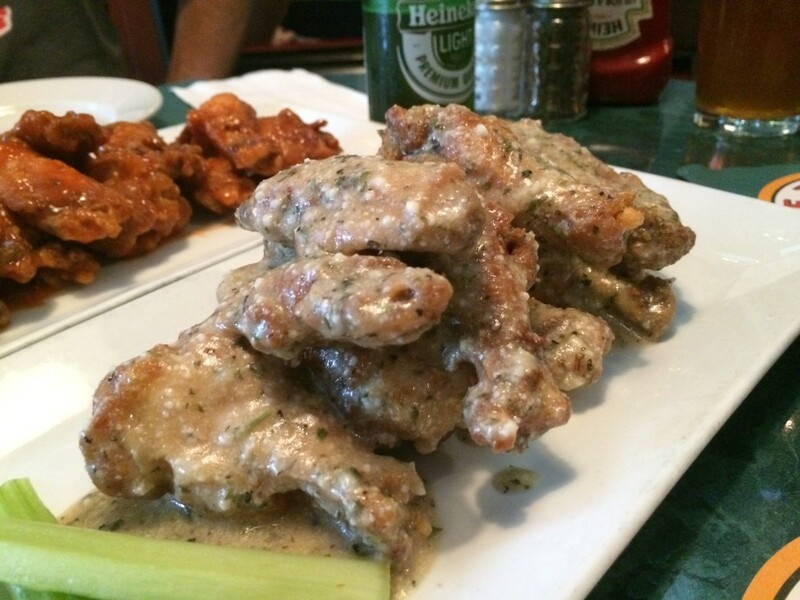 This is a wing fantasy put together by a food genius on the scale of Willy Wonka. If you ask each person on the Wing-Off which was their favorite, you are likely to get a different answer from each person. The diversity of flavors and palettes is so wide that you could drive an 18-wheeler through it. If one of these sounds good to you, it most certainly is worth trying. Old Bay and Fluff A Nutter were definitely highlights. 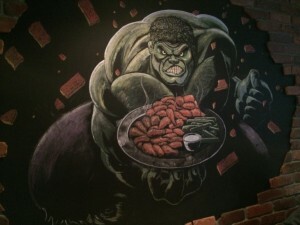 WING-OFF 25 OFFICIAL WINNER – MARLEY’S GOTHAM GRILL! 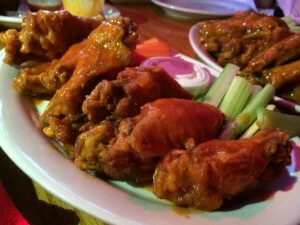 The food at Hot Rod’s, especially the Wings are very unique and worth you checking out. 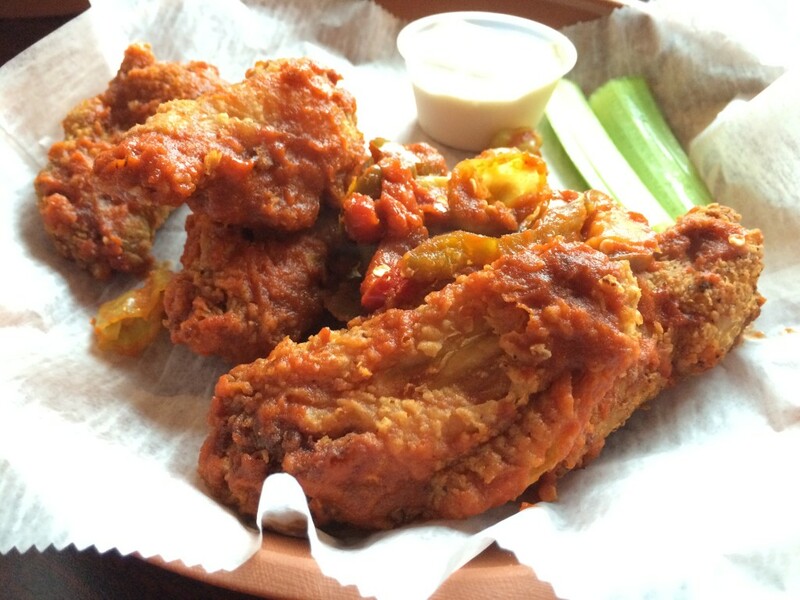 The wings at Marley’s are absolutely insane and from another universe. A wing traditionalist might have a problem with both of these concepts but a wing lover would revel in the creativity. 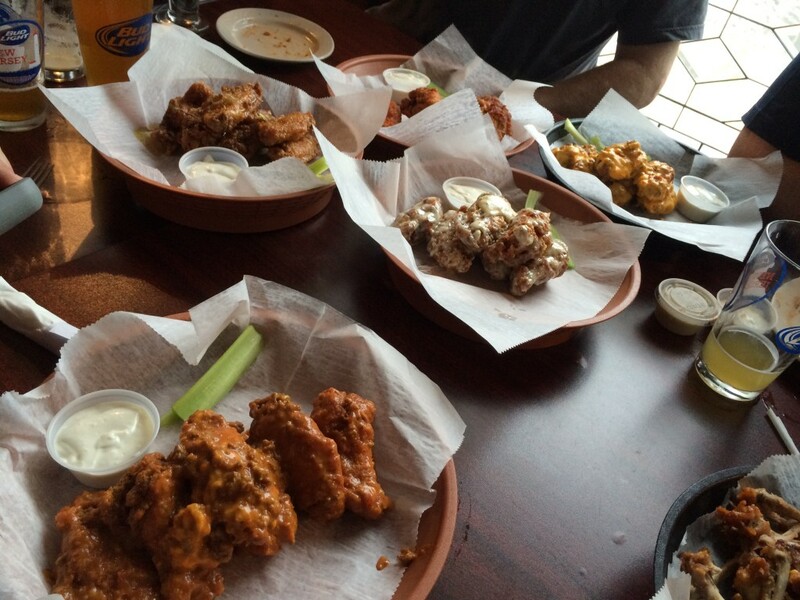 Bruno Pascale is a wing junkie. He is cut from similar cloth as we are. When he makes wings and create flavors, he is trying to blow himself away first. If it makes it to the menu, you know it’s passed his test. Now that we’ve eaten there, we can definitely say that Bruno’s wing skill is like none other. 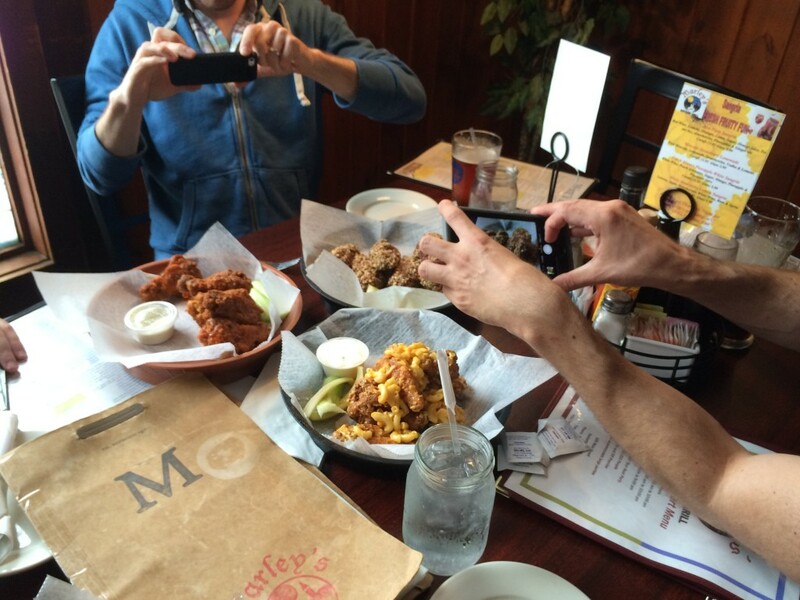 WING-OFF BONUS: MICHAEL’S ROSCOMMON HOUSE! After eating wings at Marley’s in Hackettstown, we all hopped in our cars and headed home. One of the cars decided that more wings were needed. They pulled off in Belleville NJ and had more. Because the entire group was not involved, it was not considered part of the Wing-Off. 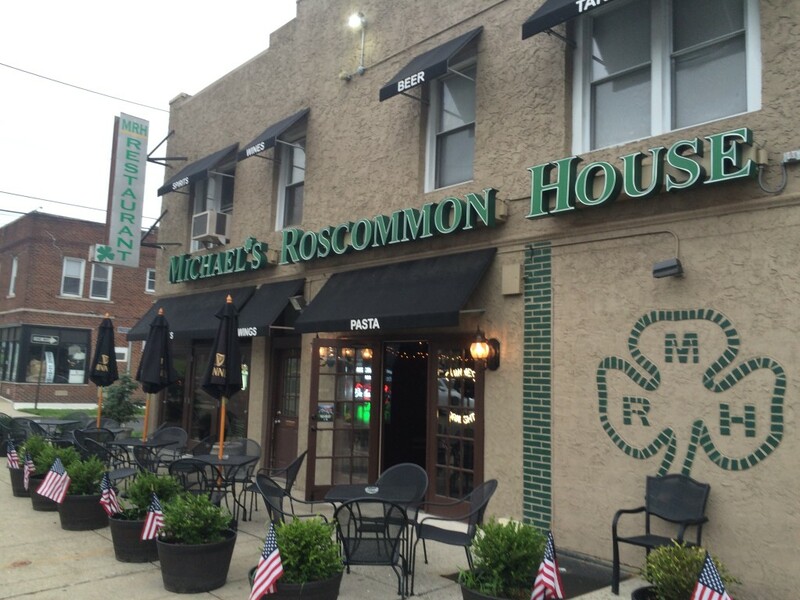 Michaels Roscommon is an Irish pub / sports bar that’s been in business since 1982. 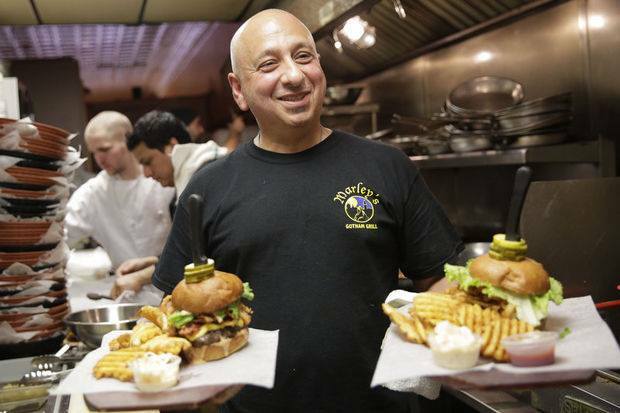 The bar is family-owned and operated and has won many awards for their food, including being voted best Hamburger in NJ by the Munch-Mobile, Star Ledger. 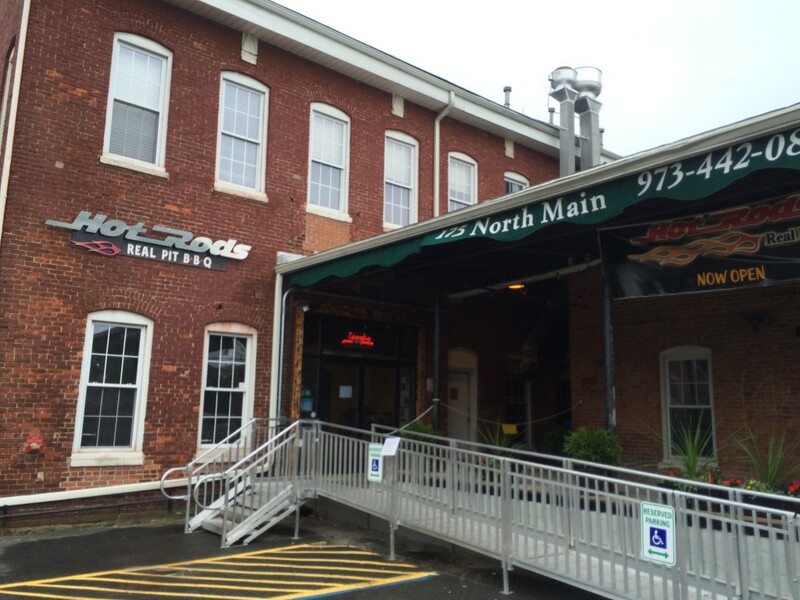 Part bar, part family-restaurant, they offer a full pub-menu from apps, soups, salads, sandwiches, pasta and Irish faves like Shepherd’s Pie, Fish & Chips and more. 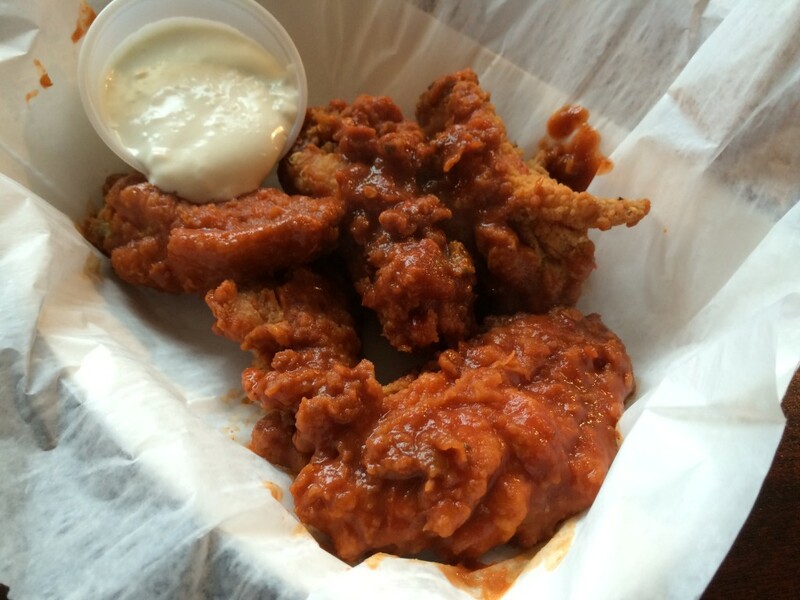 Along with your standard buffalo wings available in array of different sauces categorized by heat. 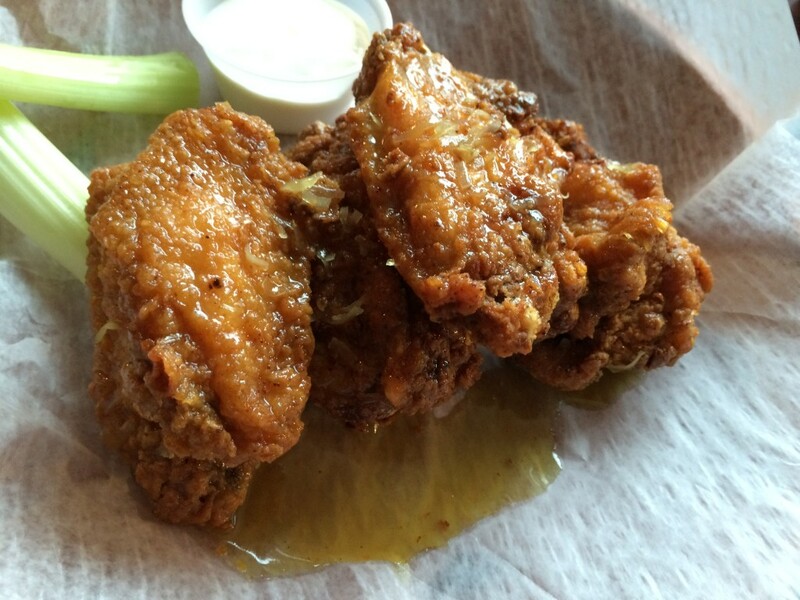 Michael’s Roscommon House has two types of wings on the menu. One of which was a Mac n Cheese wing but since we already had that experience today and stomach room was in limited quantity, we opted out. 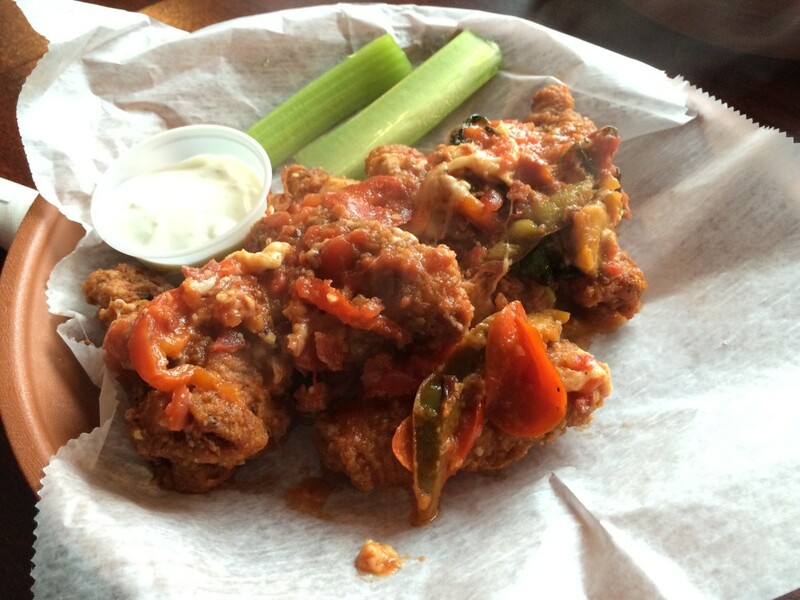 Scorned Woman – the hottest of the hot wings available. 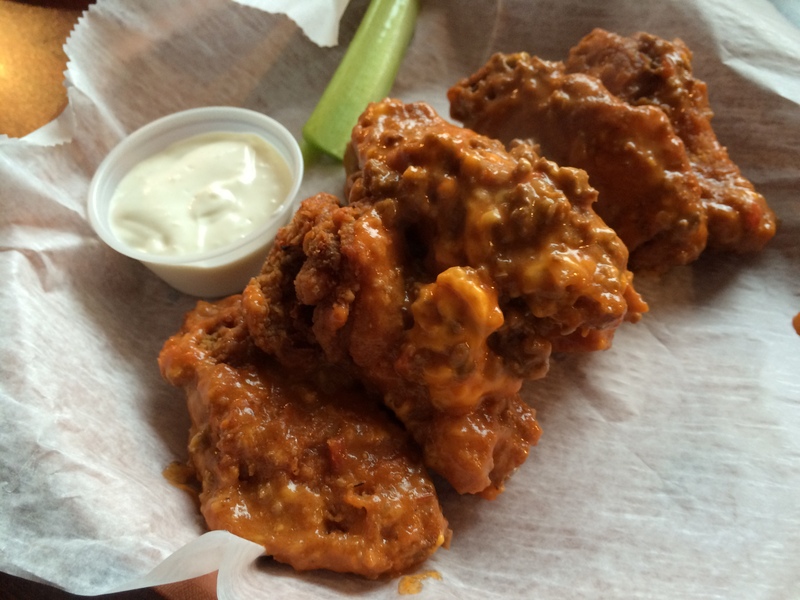 Michael’s Roscommon had the most stylistically typical buffalo wings of the day and if that’s what you are looking for, they will deliver that experience.